Lindsay Diaz has run into one struggle after another since last December’s storm. The duplex she owned was ripped to pieces. She was underinsured. Then a local demolition company with the wrong address mistakenly tore down what was left of her home. Construction on the rebuild is just now getting started a year later. Holiday decorations are up. A cork board in the kitchen is tacked with notes and lists. And toddler toys are lined up in the living room. Everything about this rental house feels like home. Lindsay Diaz says it’s not. Diaz lives here with her boyfriend and their little boy, Arian, who turned 1 in July. 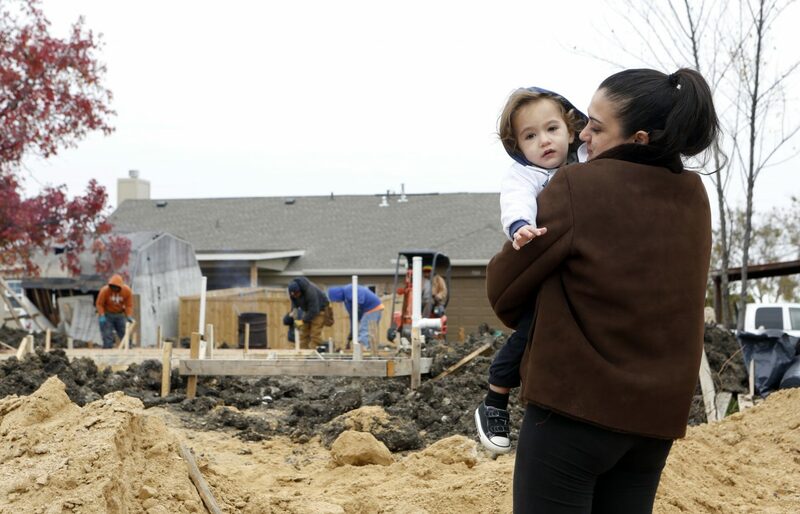 They moved into this place — their second rental — after their tornado-damaged duplex was mistakenly demolished by a wrecking company this spring. “I knew this wasn’t going to be temporary anymore. We looked for a bigger home, that way we could gather all of our items and just store it,” Diaz says. Diaz had homeowners insurance on the duplex, even though her policy would have left her a little short when the time came to pay for repairs the home. After the accidental demolition, she used her insurance money to pay off what was left of the mortgage. She had owned the place for three years. The new rental house costs $1,400 a month. Her old mortgage payments were less than $700. Diaz has filed a lawsuit again Billy Nabors Demolition, the wrecking company, for increasing the time she has to be out of her home and for the cost to rebuild it. She took out a loan to start construction. The plumbing finally went in last month. 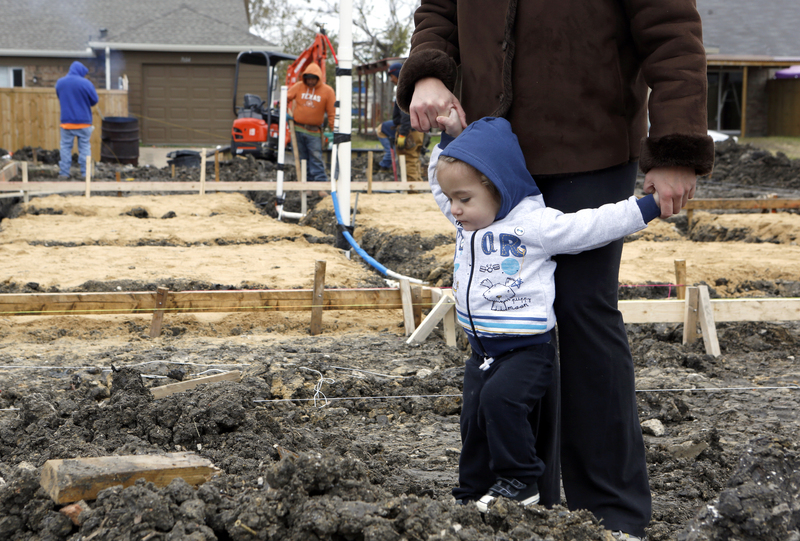 Diaz and her family should be moved into their newly rebuilt home by the end of March. She can’t believe almost a year has passed and so little has been done. Social worker Valencia Alexander says tornado victims will interpret the fast-approaching one-year anniversary in their own ways. Some may have a hard time with the milestone. “That date coming back again, there has been much research on how people reenact the same fears and anxieties,” she says. Alexander works for the city of Dallas and helped with counseling efforts after the storm. The anniversary of the deadly tornadoes falls the day after Christmas — and that complicates things. 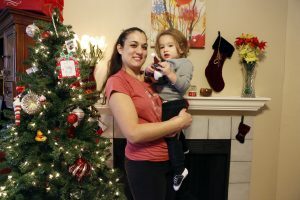 Lindsay Diaz admits she hasn’t looked forward to the holidays this year the way she usually does. And now? Certain kinds of weather put her on edge — like one afternoon a few weeks ago. Her 17-month-old son Arian is more concerned with his toys than the weather, and Diaz spends all her time making sure his life is healthy, happy and whole — no matter where they live. Still, she looks forward to the day they’ll all go home, even though it’s hard to imagine that day will ever come. She says the process of rebuilding a life is something she’ll always remember.